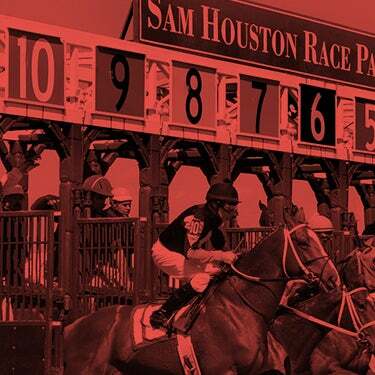 (Houston, TX) - There is something for everyone at Sam Houston Race Park with an action-packed weekend of entertaining events and live Thoroughbred racing. The festivities kick off on Friday evening with an appearance by Runhappy, the pride and joy of James "Mattress Mack" McIngvale, his wife, Linda, and her twin sister, Laura Wohlers, who is racing manager for the McIngvales. Bred in Kentucky, the son of Super Saver had an extraordinary year, winning six consecutive stakes and setting a track record in the Grade 1, $1.5 million Breeders' Cup Sprint on October 31 at Keeneland. Based on his exceptional performance throughout 2015, he was honored as Champion Sprinter in the annual Eclipse Awards on January 23. Racing fans at Sam Houston will see Runhappy in person as he parades in front of the grandstand following the third race of the evening. He will then be available for photos adjacent to the Pavilion Centre. A special commemorative saddle cloth will be autographed for a silent auction on Kentucky Derby Day at Sam Houston Race Park. The proceeds will benefit the Permanently Disabled Jockeys Fund (PDJF). Prior to his Breeders' Cup victory, McIngvale stated that if his horse ran well at Keeneland, he would do his best to bring him to Sam Houston Race Park to show his support for the racetrack, which is just minutes from McIngvale's anchor location ofGallery Furniture. 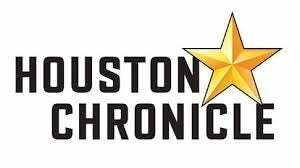 "We are very grateful to the McIngvales for making the arrangements to bring this great champion to Sam Houston Race Park," said Jamie Nielsen, Sam Houston Race Park's director of marketing. "It will be a thrill for our fans to see Runhappy in person." The Friday night card gets underway at 7:00 p.m. (CT). It is always 50 Cent Beer Fridays featuring 50 Cent Draft Beer and $1.50 Wine Specials from 6 p.m. to 9 p.m.
Saturday night features the return of the Wiener Dog Races. The fun-filled and family-friendly event will feature Dachshunds in all shapes and colors racing a distance of approximately 30 yards in between live thoroughbred horse races. 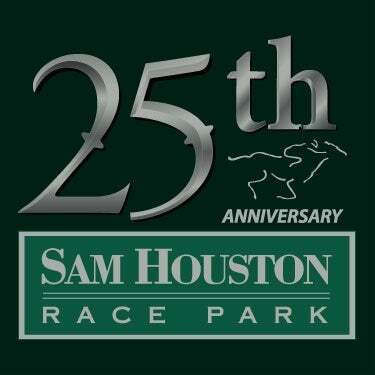 Sam Houston Race Park will present two six-furlong stakes on Saturday, February 20. The Clarence Scharbauer Texas Stallions Stakes Series includes the $75,000 Two Altazano Stakes and the $75,000 Jim's Orbit Stakes, both for accredited Texas-breds. The Texas Thoroughbred Association (TTA) renamed the showcase series to honor the late Clarence Scharbaurer, Jr. who passed away in 2014. Hall's Family Trust's homebred Too Much Prada headlines the $75,000 Two Altazano Stakes for accredited Texas-bred fillies. The daughter of Too Much Bling won last month's $50,000 Bara Lass at Sam Houston Race Park, which marked her third career victory. Trained by Danele Durham, Too Much Prada will reunite with rider Glenn Corbett, who guided her to her Bara Lass win. 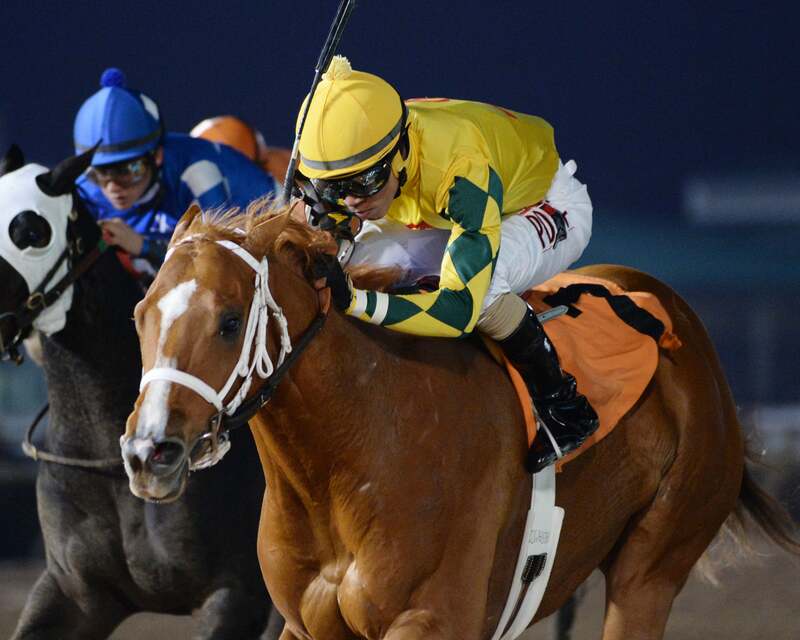 She also clinched a front-running score in the $75,000 Texas Stallion Stakes last September at Retama Park. "She's training well and posted a nice work yesterday," said Durham, who shipped her filly back to Oaklawn Park after her victory here on January 22. Durham is very grateful to Hall's Family Trust owner Lewis Hall for his dedication to Texas breeding and racing. "He's a wonderful owner," said Durham. "It's an honor to train for someone who puts the health and welfare of his horses first." Her five rivals include Bara Lass runner-up, Indygo Rocket, owned by Riley and Ronald Morgan and Racing to the Cross LLC's Vanilla, who completed the superfecta in the six-furlong Bara Lass. Another interesting contender is Cosmo Cassis, a Grasshopper filly, bred and owned by Fletcher Properties, Inc. She made her debut at Sam Houston Race Park on January 23 and broke her maiden with a convincing 11 length margin under Lindey Wade. Trainer Robert Young had no hesitation in moving her directly into stakes company. "She is a very nice filly and was working extremely well for her debut," said Young. "You never know how they will do in their first start. She was so calm in the paddock and then went out there and did what she does in the morning. 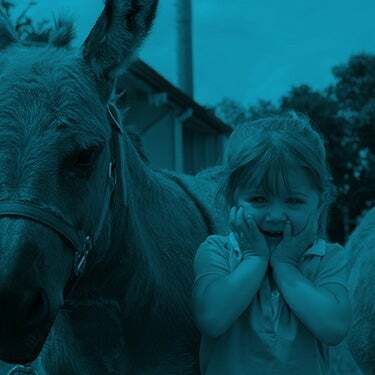 We are excited to run her Saturday." Trainer Steve Asmussen won two previous editions of the Two Altazano with Color Code in 2012 and. Makeshift in 2013. He ships in Thievery, a Valid Expectations filly owned by the Ackerley Brothers Farm. She ran second to Too Much Prada in the Texas Stallion Stakes last September and will make her tenth career start Saturday evening under current leading rider Iram Diego. The Two Altazano will run as the eighth race of the card. Trainer Bret Calhoun has swept the Texas Stallion Stakes at Sam Houston Race Park two years in a row. In 2014, Ibaka won the Jim's Orbit and Fiftyshadesofgold was sensational in the Two Altazano. Last year, he won the Jim's Orbit withSupermason and the Two Altazano with Promise Me Silver. Calhoun has another rising star for the 2016 Jim's Orbit with Victoria Ashford's homebred Bravura. The Early Flyer colt was much the best in last month's $50,000 Groovy Stakes, covering six furlongs in 1:11.69. Jockey C. J. McMahon, who is currently at Delta Downs, will ride the 2-1 morning line favorite on Saturday night. Trainer Danny Pish will saddle two in the Jim's Orbit. Keene Thoroughbred LLC's Silver Doddge, was runner-up in the Groovy under David Cabrera, who has the return call aboard the gelded son of Silver City. Pish will also give a leg up toDeShawn Parker who will pilot Will Farish's homebred Prediction. He is sired by Valid Expectations, and makes his stakes debut after a convincing maiden-breaking score here on January 19. Hall's Family Trust's Imma Bling and Kenneth E. Sykes' Jet Over, who ran third and fourth, respectively, in the Groovy Stakes, will also compete in the six-furlong JIm's Orbit. The stakes will run as the ninth race of the Saturday evening card. Nominations closed on February 12 for the $100,000 Maxxam Gold Cup, $50,000 Jersey Lilly, $50,000 Bucharest Turf Sprint and $50,000 Texas Heritage Stakes. The Sam Houston racing office confirmed that 35 horses are listed for the Maxxam, the mile and one-eighth handicap for older horses. The Maxxam Gold Cup has produced exceptional champions since its first running in 1994, including Valhol, Student, Alumni Hall and Red Rifle. Last year's winner was Albano, bred and owned by Brereton Jones and trained by Larry Jones. The draw for the February 27th Maxxam Gold Cup card will take place on Saturday, February 20. Iram Diego had another solid week, winning eight races to move into the lead in the jockey standings with 28 trips to the winner's circle. DeShawn Parker, who was the leading rider at Sam Houston in the 2015 Thoroughbred meet, is second with 26 wins and last week's leader, David Cabrera is in third place, winning 23 of his 136 starts. Lindey Wade added five wins for the week and is fourth with 19 wins. Steve Asmussen won four races last week to take the lead in the trainer standings with 15 wins. The nationally prominent horseman has won seven previous training titles at Sam Houston Race Park. It's been a great meet for Mindy Wills who has saddled 13 winners to take possession of the second place in the trainer standings. Karl Broberg and Danny Pish are tied for third with 12 wins each and Jerenesto Torrez is in fourth place with 9 first-place finishes following the first five weeks of the meet. Asmussen is also off to a great start as an owner with eight wins this meet. Mindy Willis and Stonewall Dominion LLC/ Jose Luis Espinoza are tied for second with six victories. End Zone Athletics, Inc. follows with four wins this season.